Aceing hole 17 at Addison Oaks at the 1992 Worlds in Detroit. My second Open tourney ever, and taking 33rd. It felt like I had a chance to compete in this sport after that. 1995 Worlds Final Nine. I could play those 9 another 100 times and not match that. 1995 National Doubles. That win with Scott really gave me a lot of confidence, then when I beat Scott and Grateful Disc that year...bring on the Tour. The signature car in 1995 was great... 500+ signatures, including 20 Worlds Champs, a mushroom basket from John Notenboom on the roof... priceless. 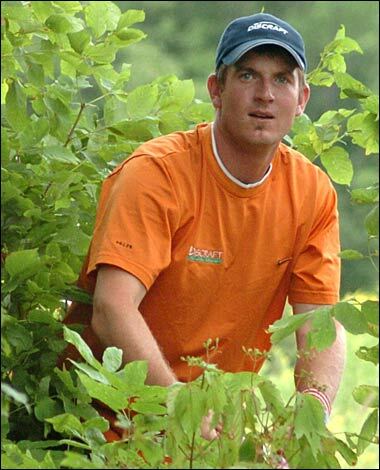 2004 Great Lakes Open Final Nine. I solo birdied 18 at the Beauty then hole one at the Monster from the alternate tee, then hole 2 on the Beauty to take the lead. Too bad I couldn't par 18 at the Monster... d'oh. Winning the NorCal series championship two weeks after moving to California in 1995 was fun -- howdy boyz -- and it was such a loaded field! Winning Friday night bring your partner doubles at the K.C. Wide Open in back to back years with Darrel Nodland was pretty fun. Both times we crushed alternate shot to come from behind against another loaded field...good times. Making the finals at the 2003 Worlds in Flagstaff with my girlfriend (now wife) watching was great. Earlier that year she had come down to the Memorial to watch me take 51st and miss cash by one shot -- my worst finish ever by 18 places (33rd at Detroit Worlds was the previous low point). She stuck with me all year as I got the game back together. That was special. Making the Worlds finals in 2007 with a birdie on the first hole of a 3-way playoff. Hadn't made the lead card all week until the final nine... felt good to be in the mix again. Best disc golf complex I've ever seen at HighBridge. Thanx John! USDGC was good to me again too. Only got one practice round squeezed in Tuesday afternoon, then came out with a 60! Held to the lead card all week, then blew it on the last hole... Gotta work on those last holes! Watch highlights from Mike's 2007 World Championships final nine appearance. Never put too much importance on any one shot. There are too many shots out there to beat yourself up about one or two. I'm always amazed at how crappy I can play for short periods at a tourney and still pull it out in the end. Let it go. Shot selection is another easy mistake to make. Calculate the risk to reward bonus, and factor in the odds of actually making the shot. Also, throw a shot that's naturally moving away from danger. Pick a target that's a little less aggressive. For example: on a hole next to water, aim 20 feet to the dry side of the basket. If you miss towards the water by 20, you're parked. If you miss to the dry side by 20, you have a 40 foot putt you can go for or lay up. If you aim at the basket, the comparison is a little different. It's all about margin of error. Work on alternative releases. Getting out of trouble, putting around obstacles, dropping one in over the trees, skipping one around the corner, cranking up the sidearm for an easy opposite spin hyzer, rolling under and around trees, sliding one upside down under a pesky pine tree. There are so many ways to throw the disc. I'm not saying you need to master every shot, but have a few different ones you can rely on when you need it. Play Bocce! To me this is the best upshot practice game, and a lot of fun. Get a group of 3-5 golfers and your putter or short upshot disc. Use a designated target disc... I prefer using an UltraStar. First person throws the target disc, then follows with their upshot. The subsequent players all throw from the same spot. If the shot is blind, all players must stay behind the mark... moving around to get a better view is a no-no... closest shot gets a point, farthest shot losses a point. First to 5 points wins. Best on interesting grassy terrain with obstacles. Try it... you'll like it! Give yourself a break. Hit the hard shots when you have too, not just any old time. Concentration is what really separates the men from the boys and the women from the girls. Have a plan... know your game, execute your plan, let the mistakes go and work on the next goal. Personally, I play fairly deliberately, it works for me. Figure out what works for you and stick to it. Overplaying: Just playing too much can ruin a good thing. Do other stuff... keep it fresh. I find I play better after taking some time off and having fun doing other things. Warming up: My personal pet peeve is not taking care of your body. DO NOT roll outta the car and start throwing drives. I don't care who you are, or what shape you're in. Loosen up first, and get those fast twitch muscle fibers going. It's not just a matter of bending over and touching your toes and putting a few times. I heard a great quote from a pro baseball pitcher about getting ready for the game: 'Don't throw to warm up...warm up to throw.' Watch most of the top pros, especially the masters. They all have a pre-round warm up routine, and this is not a coincidence. Personally I usually run or rollerblade around for 10 to 15 minutes before I throw a single disc, then some plios and dynamic stretches focusing on the lower legs and hips is next, stretch out the shoulders, then throw some meaningless shots in a field moving from 50%, 70%, 90%, then some drives. Play some holes -- maybe a key section of the course -- then hit some putts. Putting is the last thing you should be doing before the round starts. Make sure you putt your last few in from 20 feet or so. These are the ones that kill. Have enough water, maybe an energy bar for the back nine... and go have fun. 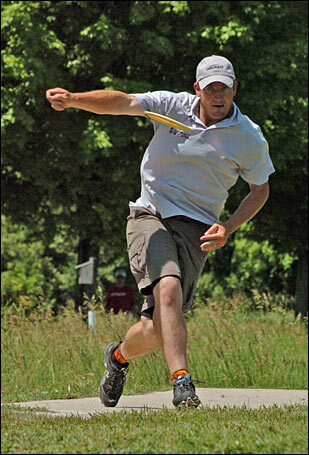 A player with iconic form, Mike Randolph is a rare breed of pro disc golfer. Some years he might only play one tournament - the World Championships - and still finish top five. Yes, he's that good, and no hack at Ultimate either. Milford, MI Almost enough of a reason to move back to Michigan. Warwick, NY A real challenge, with potential two stroke swings on any hole. Aspen, CO Pure beauty. I play better when I bike up in the morning... great after round ride down! Golden, CO Jim Cannon's private course. Get ready to hike, and hope it doesn't get windy. -10, +10 it's all possible. About Mike's Bag - Not only can Mike Randolph win without a lot of practice, he's also a big fan of old school golf discs. Much of what he throws is no longer in production, and only available as collectibles. Read on. (168-172) My ultra long driver of choice. Wanna get way out there...let 'er rip with this thing. I have only thrown them at elevation, so I would likely move up in weight in denser air, but I'd still have it in the bag. Makes that 500 foot birdie an actual possibility for me, instead of just a prayer. When I first started throwing these, I couldn't believe how easy it was to send it a mile. Ain't technology great! If it has to be long and has to land in a tight zone... it's the Predator. I have two kinds of these. The red ones that came out without the little 1.7 left arrow on the top. These things are very overstable, can be trusted in the wind, and have a knack for producing the big birdie or the big controlled drive. I also have some white ones with OP on the bottom (Original Predator). These are the same mold as the Tsunami, but with less Z plastic mixed in with the X. When the Predator came out -- with the Wildcat and the Talon -- the original feedback was that it needed to be more overstable, so the mold was tweaked a little. By the time I realized that the Predator was the best of the three, the mold had already changed. The Tsunami mold was created in an attempt to recreate the original Predator mold, and did so nicely. The Stalker is money. When you must stay straight, but you need a good distance shot, grab this disc. It's stable enough to hold whatever whatever line you need at higher speeds. Stalker is my new favorite controlled driver. Check it out, it'll be your favorite too! (173-175) My very favorite hyzer spike or forehand driver ever. Easy to release and control on the forehand, low, high, S-curve... whatever ya like. The reason this disc stays in the bag over the newer high-tech discs is it's predictability and the fact it won't go too far. In the day I could forehand an X-Clone around 380 feet without turning it over at all. It only goes around 350 these days after a few shoulder injuries, but believe me, the forehand X-Clone has given me the edge on numerous occasions. I have a big stack of these in my disc room as well. The biggest drawback of this disc is the thin rim: it buckles real quick when you drill a tree. I've retired multiple X-clones after one or two tourneys, hence the stack. Gotta have it in the bag. (173-175) Love these at elevation. Not always in the bag, depends on the course. With today's high-speed drivers, I think it's actually harder to throw exactly 400 feet than it used to be. Lean on a new driver, and you're going 450; back off the new driver a little to keep the distance down, and you throw off the flight. I like to throw between 80-100 percent on any drive I can, so this is my long stable driver, very controllable to turn over slightly and play the S-curve. Like the Marauder, it is very predictable. I prefer the dyed ones. I loaded up on these a few years back, and I'm glad I did. (175-183) Here's another oldie but a goody. Not sure when this one went away, but it's still an awesome disc. For me it flies like a Buzzz on steroids. Good thing discs don't get drug tested, cause this thing is beefy. I use it for 325-380 feet straight and gentle left-to-right shots. If you want to lean on it, go ahead, just give it a little more hyzer angle. I love this disc because it goes straight, and it just keeps going. You're as close as you can get to a guarantee that this disc will not do anything dramatic in the air. Stands up to a medium wind, flies great to hold a straight line in a right to left wind. Sure there's lots of great new discs out there, but that doesn't mean the old ones don't fly great too! (173-175) I have few nice beat up first-run Strats that I use for touch rollers or corkscrew shots, or just a normal left to right shot at high elevation. I'll also occasionally use it when I have no footing and can only wrist a shot towards the bucket... it doesn't take much to keep it straight. I will carry a newer one, usually a nice stock dyed one (thanks Jbird) if there is a hole or two on the course that requires a longer straight shot that is at the edge of Buzzz range. Some tight left to right shots are just easier for me with the Stratus. It takes less effort to release and get turning. (173-175) Money... plain and simple. This is the disc I'd play in a one disc challenge. I have three in varying stages of beatness. Fresh for the slight hyzer fade. Slightly beat for the nice straight shot, pop a little hyzer down the gut, watch it roll up about 5 degrees and sit there. It's a thing of beauty. One a little more beat up for those left to right fades, of maybe a tight corkscrew shot. Even though I throw a lot of hard-to-find discs, for me this is the hardest to replace. The lack of practice rounds and the lack of courses in Denver that can beat your disc up leaves me without a lot of opportunites to beat up discs... I'd be happy to take some beat up, flat-top Buzzes of anyone's hands. I'll give you 5 new ones for a nice old one, no joke. (173-175) I only carry a new one, and they're pretty overstable for a midrange. I use it for a heavy hyzer finish, or to battle the wind on midrange shots and longer approaches. I like the way Wasps fly when they beat up, but I typically use the Buzzz for those shots. (173-175) Most of the Magnets I have are old first-runs with no letters on the bottom. I throw some of the newer ones for short range drivers if they're nice and stiff. I'll use a slightly beat or very beat one for nice straight shots, especially if the shot requires a higher flight path. Also this is probably the straightest flying disc for downhill shots you can reach the basket on. Just pop it on line and watch it hold all the way down. Top of the world at Delaveaga, it's a Magnet shot. This is my main driver under 275 feet, and for any approach shot not quite Skystreak worthy. Holds a great line with the forehand or backhand. (175-183) This disc is just fun to use. For a nice controlled straight or left to right (I'm a righty) shot between 80 - 180 feet, I'll pull this one out. I'd say this disc is batting about .950 for me in terms of executing the shot, and it usually invokes a nice "what was that thing?" from onlookers. There are two basic kinds of Skystreak; the indestructible stiff plastic, and a softer plastic very similar to the D line. I prefer the softer D plastic. This disc just floats nice and slow, just like playing catch. You can run the chains, but not go by more than 20'. I'm trying to talk Jim Kenner into reissuing this disc for the 25th anniversary of it's first molding. Not a disc for everyone, and not a disc for the wind, but especially if you come from an Ultimate background, it could be for you. Good luck finding one though. (173-175) These discs came in the players pack at the 1998 Great Lakes Open in white only. Due to an unfortunate misunderstanding, the mold was altered slightly after the prototype run. The prototype APX is a little narrower at the outside quarter of the top plate, which allows them to come out of my hand cleaner and hold a more stable as opposed to an overstable line. The plastic will last forever, but I'd happily buy any more proto APXs I can get my hands on... if you've got one available, let me know.